From cup to cone, celebrate National Dairy Month! Let’s say thanks to the dairy industry. 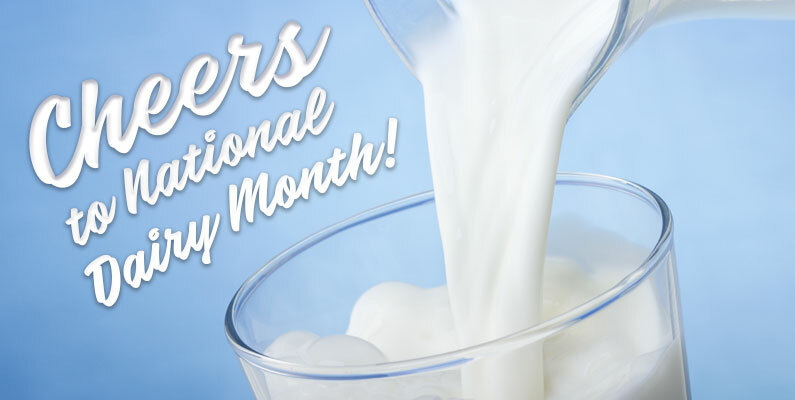 As we wrap up the month of June, please join Marketing to Farmers with a glass of chilled milk as we toast all those involved in U.S. dairy production, in celebration of National Dairy Month! Established in 1937 as National Milk Month, it began as a way to promote the benefits of drinking milk and increase consumption when the commodity was at a surplus. It soon changed to its current name to recognize all dairy products, including cheese, yogurt and of course, ice cream. Who doesn’t love ice cream? But it’s no easy feat to get from dairy cow to delightful treat, and 97 percent of the dairy farms are family-owned and operated. Caring for the precious animals that produce the milk that goes into our dairy products takes an exceptional amount of work, including providing them with forage to graze, the highest quality nutrition, clean water, veterinary care and shelter. This month, we recognize all the individuals who participate in the dairy industry, including the suppliers that bring these products from farm to store within 48 hours. The dairy industry is also an active part of the local community, filling over 1 million jobs throughout the United States. Through the Fuel Up to Play 60 program, it provides students in 73,000 schools with access to nutritious foods and physical activity. But back to ice cream, cheese and that cold glass of milk…or chocolate milk, whichever you prefer. They say that dairy makes memories and for many of us, it’s a sundae to celebrate a special occasion or the greatest cheese pull from a slice of pizza or maybe it’s an iced cold glass of milk alongside a warm chocolate chip cookie. Whatever your preference, know that a committed team of dairy producers brought that to you, and we thank them for the work they do, the care they give, and for providing us with safe, healthy products.